To achieve higher garments or apparel or clothing productivity 5-S principles play an important role in garments manufacturing sector. In today’s readymade garments business, most of the factories are regularly maintained 5S principle for producing higher number of quality garments. As its importance, today I will present here the details discussion on 5S principles. 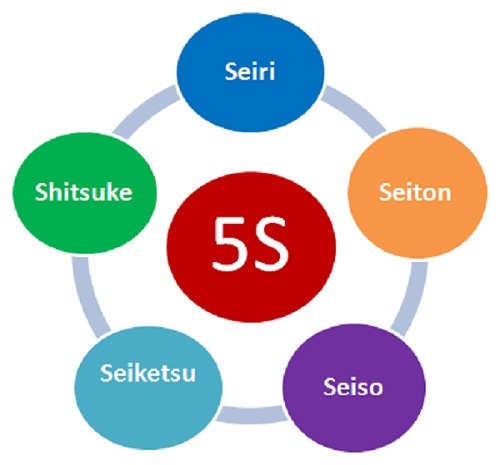 Japanese management tries to instill in the brains of employees some basic principles of work which are known in Japan as 5S principles. It is very effective in business and garments production management, which proved not only in Japan but also outside the Japan. Seiso: Keep cleaning the machines, workplace, etc. Remove idle equipment and tools. All these result in clean and tidy workplace and better work environment. This includes in arranging right materials at right place for quick access and disposal. This leads to better organization of materials and congenial work environment. Seiton results in less time in accessing materials and disposing them for garments production. This result creates the opportunity for higher garments productivity. Higher performance in productivity and quality. Appropriate work standard leads to better employee performance, higher quality and productivity. Category: Garments Production Tags: effect of 5S Principles on apparel Production, how to increase the garments productivity?, Influence of 5S Principles on Garments Production, mention the importance of 5S principles in readymade garments sector., what do you mean by 5S principle?